WASHINGTON (Army News Service) -- "More than any other crucible, war brings out the worst and best of mankind," said Vice Chief of Staff of the Army Gen. Daniel B. Allyn. 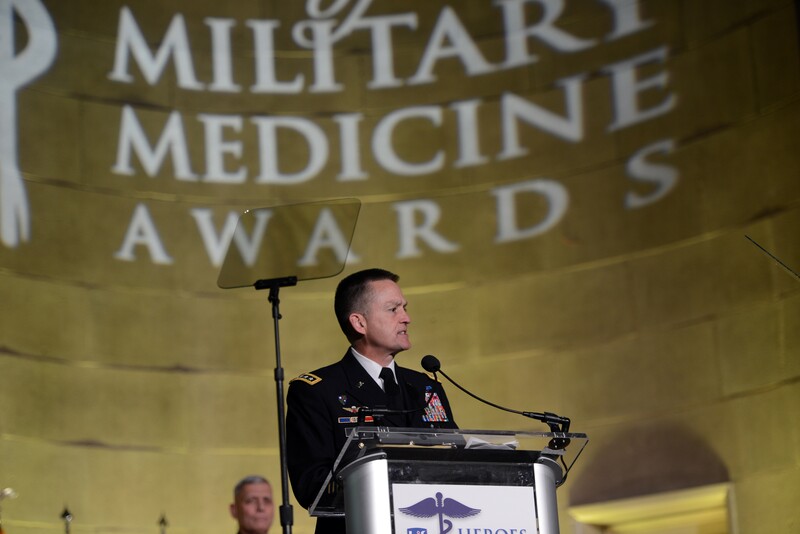 "Without question, it is our military medical professionals who reflect the amazing light of creativity, compassion and exquisite care, and it is especially brilliant in these darkest moments." 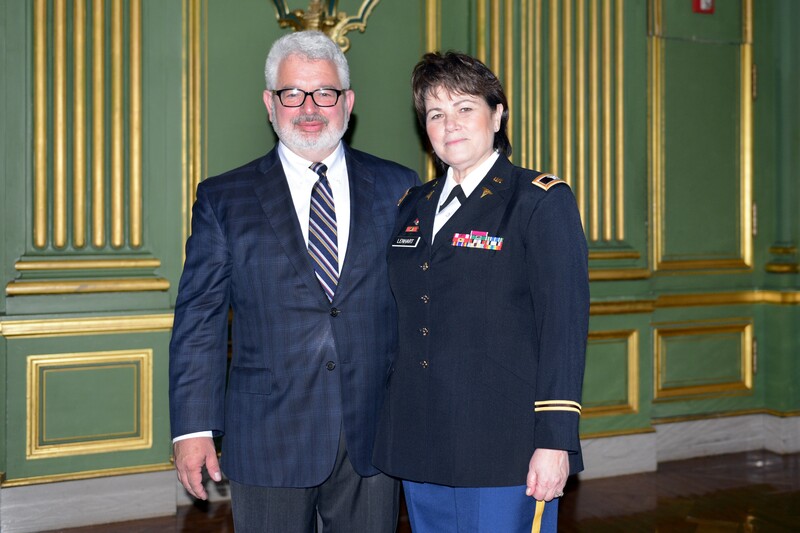 Allyn was named as a "Hero of Military Medicine, Senior Leader Honoree," May 5 during the Heroes of Military Medicine Awards banquet in Washington, D.C.
"For 35 years as an infantryman, I've experienced first-hand the skill, ingenuity and passion of our medical professionals across the joint force," Allyn said. "I've seen corpsmen, medics, doctors, nurses and technicians from all services leverage their craft to save lives under the most demanding environments on the face of the Earth." Included among those medical professionals is Army Col. Martha K. Lenhart. She is an orthopedic surgeon, has a doctorate in pathophysiology, and specializes in hand surgery. She is also responsible for publication of numerous medical books. Lenhart was named the "U.S. Army Hero of Military Medicine" during the same event, and introduced Brig. Gen. Robert D. Tenhet, the deputy surgeon general of the Army and the deputy commanding general (support) of U.S. Army Medical Command. "All our Soldiers, Sailors, Airmen, and Marines have the opportunity to represent our country as diplomats," Tenhet said. "During her Afghanistan deployment, Col. Lenhart recognized the need for a focused approach to management of the injuries of infants and children in combat scenarios." Out of her experience there, Tenhet said Lenhart spearheaded publication of a book that would be "the first-ever pediatric military medicine book," called "Pediatric Surgery and Medicine for Hostile Environments." That book was cited by the American Medical Writers Association as "the book most likely to save a life." The book informs other doctors around the world about ways to provide better care for injured infants and children in combat environments. 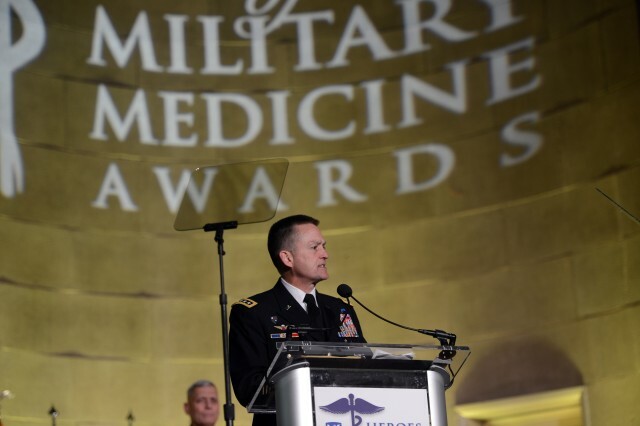 "Some would question why we in Army medicine would ever have a pediatric orthopedic hand surgeon specialist in our ranks, and what possibly that could bring to the fight," Tenhet said. "Col. Lenhart's actions answered that question loud and clear. By looking at the battlefield's casualties through the lens of a pediatric hand surgeon, she viewed the chaos in ways others did not. She saw not only a medical need, but a humanitarian need as well. And she did something about it. "There are people in Iraq and Afghanistan who noticed, and the long-range diplomatic effects can be numerous. No amount of political propaganda can displace the emotional connectives that occur when one human connects to another human in a supportive, compassionate, and caring way." Lenhart served in Afghanistan in 2003 at Bagram Air Base, early on in the conflict, before the invasion of Iraq. "I walked into our tent hospital, our combat support hospital, and it was filled with local national children," Lenhart said. "That was my first exposure to Afghanistan, to the combat support hospital, and to our patient load -- which was largely children." Their facilities were set up then for adults -- adult Soldiers. But at the time, she said, there were "very few Soldiers." "You needed to improvise, in terms of what we did surgically," she said. "We needed to adapt some of the instruments. We also developed some ambulatory devices for some of these children. I'd draw a picture and work with our medical maintenance staff, because he would engineer it. He'd engineer this equipment." One example, she said, was for a patient with a single-leg amputation and forearm injury who couldn't use crutches appropriately without putting inappropriate weight on the injured forearm. She said they had to adapt the crutches to make them the correct height, but also adjusted them to allow those crutches to be used to not put weight on the forearm. Later in Iraq and Afghanistan, there was the Rapid Equipping Force that could bring gear in to make it easier to produce novel equipment, on the fly. But not back then, she said. "There was no 3-D printing then. There was no equipment like that. We were in a tent hospital. I slept in a GP medium tent." Lack of supplies in Afghanistan was exacerbated, she said, when the war in Iraq kicked off. "At the time it was so surreal. I was in Afghanistan, watching the invasion of Iraq on TV in the morale, welfare, and recreation tent," she said. "We watched U.S. troops go into Iraq. What happened subsequently was that our supply lines were diverted. We had a difficult time getting some of the surgical supplies we needed. "The junior officer who was an orthopedic surgeon and who had just graduated from his residency was my partner there," she said. "He'd been a rotor-wing pilot before he'd gone into orthopedics -- a really great guy. We're standing at the scrub sink and lamenting the fact that our supplies weren't what we wanted. And I said to him 'we're going to have to improvise,' and he counters, 'we weren't already?'" Lenhart served in both Iraq and Afghanistan, and at least two books came out of those experiences. She served as the director and editor in chief of "Pediatric Surgery and Medicine for Hostile Environments" and also as editor in chief of the award-winning "War Surgery in Afghanistan and Iraq." On the latter, she said, in order to get that book out to medical providers as fast as possible, she worked with the Army to get the book distributed digitally into the field in advance of the availability of paper copies -- though that happened too. "It was the first time they had ever transmitted a book like that through the Theater Data Medical System," she said. For medical professionals who have never served in combat environments, she provided this advice: "You have to be very cognizant of your circumstances, use your resources wisely, and be able to improvise, but do it in a smart way. You must understand the mechanics, and understand the anatomy, and understand what it is you are trying to accomplish in those particular areas, and know that what it is you are doing in certain cases isn't the definitive surgery, but rather it is a stabilizing procedure so that you can then transport these casualties to higher levels of care." 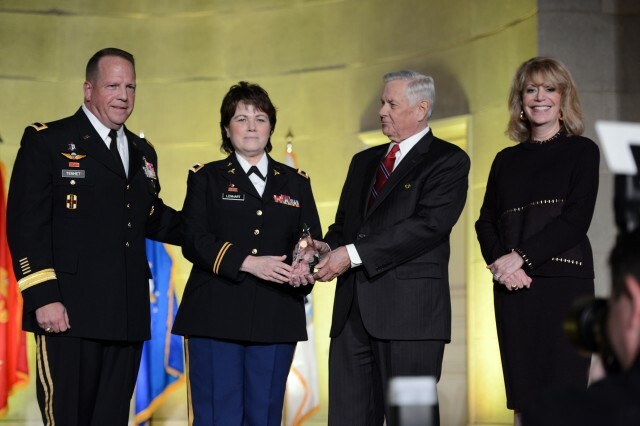 Lenhart said she accepted the award "on behalf of thousands of heroes who have served and continue to serve our country, ensure its safety, and contribute to the welling of troops."